This salt-of-the-earth epic follows a white and black soldier who return home from World War II to face Jim Crow tensions in 1940s Mississippi. WASHINGTON — She turned her NYU thesis film into the Sundance breakthrough “Pariah” (2011) before helming HBO’s Emmy-winning “Bessie” about American blues icon Bessie Smith. Now, filmmaker Dee Rees is creating Oscar buzz with her new period drama “Mudbound,” which Netflix acquired for $12.5 million to stream alongside Friday’s theatrical release. It’s the closest thing we’ve seen in a while to George Stevens’ “Giant” (1956) or John Ford’s “The Grapes of Wrath” (1940); a salt-of-the-earth epic that rises to the level of tragic literature. Based on Hillary Jordan’s 2008 novel, the film follows two families in 1940s Mississippi. White farmers Henry and Laura McAllan (Jason Clarke and Carey Mulligan) move from civilized Memphis to try their hand on the land, while Hap and Florence Jackson (Rob Morgan and Mary J. Blige) raise a family of black share croppers that dates back generations on the Delta. Henry’s brother Jamie (Garrett Hudland) and Hap’s son Ronsel (Jason Mitchell) form an unlikely bond when they’re called to serve together in World War II. However, when they return home to segregated Mississippi, they find themselves grappling with Jim Crow racism by a nation that isn’t as ethically evolved as the “why we fight” principles it projected overseas. “Over there, I was a liberator,” Ronsel says. “Sometimes I actually miss it,” Jamie replies. By now, we’ve come to expect great work from Carey Mulligan after “An Education” (2009), “Drive” (2011), “Shame” (2011) and “Inside Llewyn Davis” (2014). The same goes for her “Great Gatsby” co-star Jason Clarke, who played the lead CIA interrogator in “Zero Dark Thirty” (2012) before juggling war and peace in the impressive “Dawn of the Planet of the Apes” (2014). Thus, the biggest surprise is Mary J. Blige, who gracefully shifts from music to film in the footsteps of Whitney Houston in “The Bodyguard” (1992), Macy Gray in “Training Day” (2011) and Janelle Monáe in “Moonlight” (2016). Expect award season to show her “Real Love” with a supporting actress nomination (she also contributes the song “Mighty River,” bested by the trailer’s “Back from the Fire” by Gold Brother, who blends an old spiritual with “The Wire”). Still, it’s Jason Mitchell and Garrett Hedlund who steal the show as the colorblind war buddies. You’ll recognize the former as Eazy-E from “Straight Outta Compton” (2013) and the latter as a spitting image of James Dean in “Giant” (1956). Although, the better analogy might just be Sidney Poitier and Tony Curtis as the escaped convicts in “The Defiant Ones” (1958), only this time the chain that’s bonding them together is the shared experience of a band of brothers. Their friendship works not only because of their emotive yet understated performances, but also because of the subconscious techniques employed by Rees. For instance, look closely at how she symbolically stages the barn scene, where she begins with both actors spaced far apart from each other in their initial mistrust, then brings them closer together as they bond. It’s one of many exquisite compositions, not to mention the stacked profiles of folks sitting side-by-side in the front seat of a truck. For Rees, it isn’t for show; it’s a sensibility that comes honestly from her own Nashville roots. While she worked with “Arrival” cinematographer Bradford Young on “Pariah,” this time she teams with “Fruitvale Station” cinematographer Rachel Morrison. Together, they paint a cinematic canvas like a Horace Bristol photograph. Rees is the heir apparent — as is fellow director Jeff Nichols — infusing Americana landscapes with a newfound moral code. In Nichols’ “Loving” (2016), Joel Edgerton is left wondering, “Why can’t I marry whoever I want?” In Rees’ “Mudbound,” Ronsel asks himself, “Why did I come home to a country that treats me worse than overseas?” It’s a social commentary with scope. Leading the domestic pushback is Jonathan Banks’ terrifying turn as the McAllan patriarch Pappy. If you’ve seen “Breaking Bad” or “Better Call Saul,” you know that Banks is a force of nature on screen. 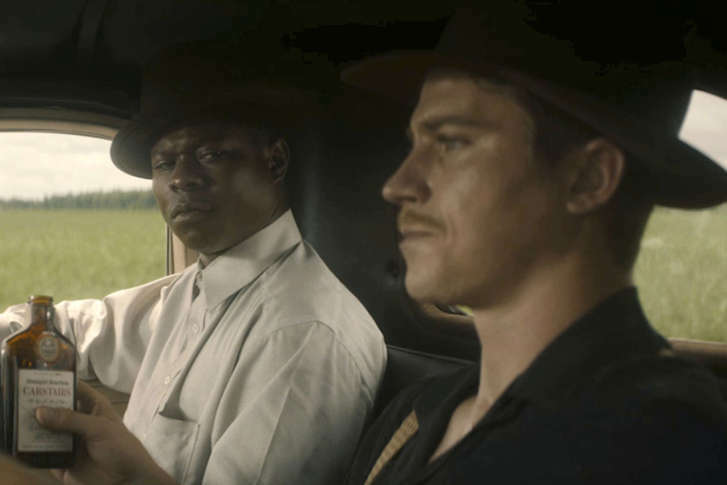 “Mudbound” cements his power with an abhorrent antagonist, lulling us with grandfatherly charm before revealing his true backward mind and racist heart, which feed the KKK sympathies we still see today in the deadly protests of Charlottesville, Virginia. That time is the Jim Crow era. It’s refreshing to see a film deal with this key era between the Civil War and the Civil Rights Movement. Too often, Hollywood restricts its focus to slavery — “Roots” (1977), “Glory” (1989), “12 Years a Slave” (2013) — or civil rights protests — “The Help” (2011), “Selma” (2014), “Hidden Figures” (2016). There’s an entire 100-year history of lost opportunities between those periods that “Mudbound” presents as teachable moments. Fitting to its era, the entire thing builds to a fatalistic gut-punch. Perhaps it’s the presence of Clarke and Mulligan, but there’s a Gatsby air of impending doom each time a car drives a dirt road. This fatalism exists from the start, opening with characters digging a muddy grave (hence the title “Mudbound”), then watching as fate brings them to that tragic conclusion. However, unlike other merciless filmmakers, Rees offers a final glimmer of hope. Call it idealistic or fantastical, but it allows Rees to transcend her cynical contemporaries with a glimpse of “what could be” rather than “what was.” This is the film’s true power. Our bodies may be mudbound, but our spirits — if you do right on this earth — are bound for glory.